I was honestly surprised by this book. As has been the case with most comedians and the books they have written, I expected this to be a bit of an autobiography in the veins of Bossypants , Yes Please , The Bassoon King: My Life in Art, Faith, and Idiocy , and Is Everyone Hanging Out Without Me? Instead, I was presented with a book filled with data, analysis, and information about how modern relationships work when compared with the relationships of past generations. Having gone through some of this “Modern Romance” myself, I could certainly relate to the information being presented, nodding my head in agreement as things I noticed suddenly had explanations pinned to them. But it wasn’t that the book was not an autobiography that surprised me, it was the humorous way that Aziz Ansari managed to present this subject matter, while also maintaining high scientific rigor. If I were to put this in a category of non-fiction humor, it would probably be in the vein of I Am America but without the tongue-in-cheek satire. Maybe I’m even wrong in this characterization and it should fall under the collections of humor around a single topic, like the works of Dave Barry. Either way, this book was informative and not judgmental in the slightest. It was merely presenting the facts that had been discovered, but in such a way that made me laugh about the whole situation. For those people who are in relationships, want to be in relationships, or who just want to play the singles game, this book is an optimistic look at what has changed, what is likely becoming the “norm”, and what we should all expect from relationships in the future. Simply put, the smartphone has complicated the world of romance, but it has also given a lot of benefit to those who know how to use it as a tool to get what they want out of life. 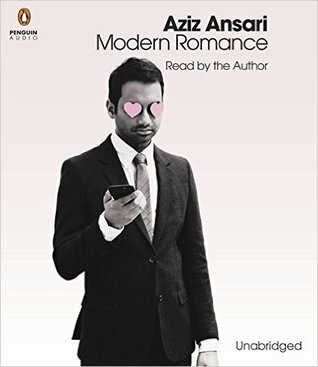 I would almost encourage Ansari to continue writing books like this, because his humor has made a somewhat dry subject a lot more palatable. A great book that explores why the dating scene is so different now, I give Modern Romance 4.0 stars out of 5.